Most movies appeal to our senses of sight and sound. I can see the story playing out, and I can hear the music, sound effects, and dialogue. However, not many movies have the ability to drawn in more than those two senses. It is a rare gift to find a movie that appeals to multiple senses and makes you feel as if you are fully engaged on both a soul and sense level. If you have never seen this delicious movie, might I kindly urge you to drop everything and watch it immediately. It is one of the best, richest films I have ever seen and I am about to tell you why. The Hundred Foot-Journey follows the Kadam family who leave India for France looking for a better life. They find a charming village to settle in and open up their Indian restaurant. Their location? Exactly one-hundred feet across the road from Madame Mallory’s Michelin-starred eatery. What follows is a story about memories, love, people, and food. Now, I can hear your question. This movie is still just a movie right? It can’t produce smell, literal food, or hand you something out of the screen to touch. So how can I say that this movie appealed to more than my sight and sound senses? The Hundred-Foot Journey is a movie about people that uses food as the medium to communicate the heart of story and messages. The brilliance here is that food is a common denominator that everyone on planet earth understands and connects with. Food reaches us physically and emotionally. We touch it, see it, smell it, hear it, and above all, taste it. Have you ever seen a peach and had a flashback to a fun summer afternoon spent in the orchard? Does the smell of cinnamon make you feel like it’s Thanksgiving? When you hold a muffin do you remember your grandma? Has your mouth ever watered at the sound of someone crunching down on hot, buttery toast? When you bite into a cheeseburger, do you suddenly feel like you are on vacation again? The Hundred-Foot Journey triggers the memories of our own personal experiences with physical things such as food in order to draw us into a story on a sensory level. In the beginning of The Hundred Foot-Journey, we see Mrs. Kaddam teaching her son Hassan how to cook. But it’s not the typical one cup of water, 2 teaspoons of salt, stir for thirty seconds that you might imagine. Instead, Mrs. Kaddam is teaching Hassan about the soul of food. She pours a ladle-full of her stew into her son’s palm where he slowly drinks it, savoring and experiencing each flavor and feeling of the dish. Mrs. Kaddam infuses so much meaning and life experience into her food that whenever Hassan eats or cooks something, he understands the story and memory behind the food. Throughout this entire movie, the characters are deeply involved with their food. They touch it, experience the color, savor the flavor, and recognize the memories or feelings that the food arouses. No character does this more than Hassan. You taste, smell, hear, touch, and see through his eyes more than anyone else’s. You are connected on both a soul and sensory level with his experiences regarding food. At one point in the film, Hassan begins to lose himself in the process and precision of making food rather than the memories and emotions of it. It changes his entire persona and perspective. He is lost and miserable, and he cannot figure out why. The movie begins to lose its flavor as we lose our connection to the food and the heart of the story. We become distant and disconnect, just like Hassan is. We can no longer taste anything. When he reaches a very low point, he is given the opportunity to eat some homemade Indian food. The moment he bites into it his entire countenance changes and tears come into his eyes. He tastes home, himself, and his mama. He tastes who he is in his heart, the person that he had forgotten about for time has returned. At that same moment, the color and flavor return to the story for us. Our connection point is restored and we are once more engaged on a sensory level. There are so many characters in this movie who take turns being right and wrong. There is brokenness and humanity. There is beauty and tragedy. There is life, laughter, and dancing. There are happy and sad tears. The Hundred-Foot Journey is a movie about life and people; and it uses the universal language of food to connect to our senses and draw us into the story in a deep, connected way. I cannot recommend this movie enough. It is excellent both in content and form. You watch this movie and drink in every detail. It is so layered and well-done that you take in some things consciously, and others at a sub-conscious level. The Hundred-Foot Journey is a satisfying movie on every level. When you reach the credits you will feel full in body, mind, and spirit. It is a veritable feast for your soul and senses. Sparring partners can come in many forms. They can be good friends and allies. They are often love interests. Many sparring partners actually come in the form of villains who, by adding negative pressure, force the hero to get stronger. A sparring partner can also come in the form of a setting or circumstance. Here are a few examples of good sparring partners. There is no question that Han’s interest in Leia opened the door for him to reveal his big heart and put it out on his sleeve. Han’s drive to fight for Leia, Luke, and the Rebellion pushed him to greater things and more selflessness than ever before. Leia’s love for Han opened up places in her heart that she had carefully shielded. She is a more well-rounded person because of him. And let us all just recognize the masterpiece that are Han and Leia’s verbal exchanges. I think some of the most legendary film dialogue ever written takes place in The Empire Strikes Back. In the course of just a few days, Finn goes from being a frightened Stormtrooper to charging fearlessly into Starkiller Base and dueling with a Dark Side warrior. Finn makes this incredible 180 turnaround because of one person: Rey. Rey simply being who she is pushes Finn to desire to be better, to be more. And that mighty person is exactly what he becomes. Likewise, Finn touches Rey’s heart by being the first person in her life who has shown her concern, care, and friendship. His choices regarding her make a huge impact on her chosen direction. Finn was a catalyst in Rey’s life that helped move her down the path she is destined for. I wish I had time to cover everything I have to say on the subject of West-Allen. I promise you, there is a juicy article in the works. Barry Allen has been in love with Iris West since forever. Iris has always believed in Barry, even when he didn’t believe in himself. The combination of these two is dynamite. Barry runs faster, punches harder, and doesn’t give up because he knows that Iris believes in him. She is his inspiration as well as his home. Iris has always been inspired by Barry, she has always believed in him, even before he became the Flash. Her relationship with Barry throughout the years has helped shape her into a compassionate and mighty person who makes things happen. She isn’t afraid to speak her mind to Barry, even when he doesn’t want to listen. *Sigh*, we’ve lived this story so many times and it always hurts. But it still wows me. Steve Rogers immediately saw the strength, dignity, and heart in Peggy Carter. She was everything he could have ever dreamed for in a woman. Knowing her made him want to be better all the time. He carries a picture of her in his compass because Peggy is his true north, his guide, even after her death her words and heart still reach him at his core. Peggy Carter was almost instantaneously impacted by Steve Rogers. She fell in love with him on Day 1 and his memory inspired pretty much her entire life. She felt that no one, including her, could ever hope to be everything that Steve was. Keeping him in mind, Peggy lived a legendary life that inspired others. Steve had the best friend in the world, one he could always depend on. When Steve thought he lost Bucky, he kept going with Bucky still sitting in his heart. The knowledge of who Bucky was and the sacrifices he willingly made hugely impacted Steve’s life choices. Later on, when Steve learned Bucky wasn’t actually dead but now a brainwashed assassin, Steve didn’t write his friend off. He walked through fire and ice to save his friend, without hesitation. Hiccup Haddock began to come into his own as soon as he met Toothless. 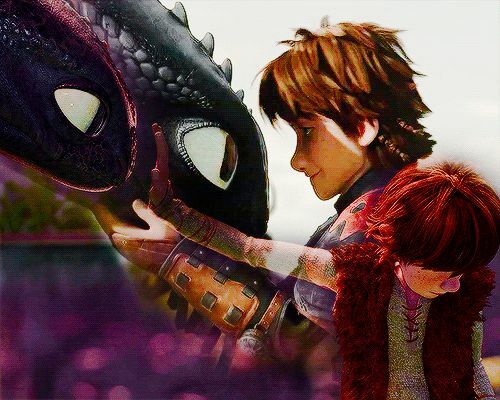 While Hiccup already had many unrecognized talents and abilities, he never had a reason to bring them forward until he met his dragon. Toothless made Hiccup grow into a selfless leader who is constantly improving. Hiccup never settles or stays stagnant, he is always improving, always growing. Bonding with Hiccup pushed Toothless beyond the bounds of ordinary dragons. Toothless was already an extraordinary dragon, but his great love for Hiccup has pushed him to do things that go even against his own biological instinct. The greatest example of this is when he challenges the Alpha Bewilderbeast in order to protect Hiccup. Hiccup and Toothless are stronger together, they inspire and push each other to greater heights all the time. Despite a rough beginning, Woody and Buzz have a friendship that real life people are jealous of. While Woody at first felt threatened by Buzz’s strong presence, he has since grown to appreciate and lean on this brave little space ranger’s shoulder. Woody helped Buzz face reality, learn resourcefulness, and taught him the joy of being a child’s toy. Buzz is Woody’s backbone. When Woody needs support, Buzz is there. When Woody can’t lead the other toys, Buzz steps up to the plate. When Woody forgets who he is and what being a toy means, Buzz is there to remind him. Great friends remind each other who they are when one has forgotten. Woody and Buzz make each other better, they fill each other out and made one heck of a team. 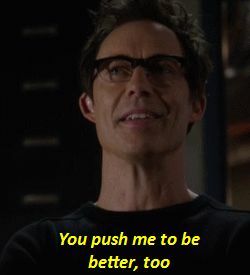 Eobard Thawne (aka Harrison Wells/The Reverse Flash) is a top example of a how a villain can be an excellent sparring partner. Thawne is incredibly layered and complex because he has been the friend, mentor, villain, and created circumstances that have all shaped Barry and forced him to become better. Thawne is constantly moving around and changing up his strategy to manipulate Barry’s actions. That being said, everything that Thawne has done has still made Barry faster, stronger, and smarter. Barry continually overcomes obstacles and springs back up. Whenever Thawne thinks he has won, or at least stolen something from Barry, the strength of Barry’s will and heart still carry the day. Thawne continually has to change and evolve his strategy because he just can’t seem to take a good Barry down. There are dozens of articles waiting to happen regarding the Skywalker family. I’ll try to keep it simple here for now. Luke Skywalker came onto the scene as a whiny kid who had raw talent and Force abilities. And he was in WAY OVER HIS HEAD. Still, he had a enough mentoring in the form of Obi-Wan to jump-start his Jedi career. He also adopted his own personal enemy, the scary guy known as Darth Vader. Luke was driven to conquer Vader for multiple reasons. He knew Vader to be the villain that destroyed his father (whom Luke worships), Vader killed his mentor (Obi-Wan), and Luke knows that in order to become a powerful Jedi, defeating Vader is his primary concern. This drive to defeat Vader pushes Luke to train. His time spent on Dagobah was all geared towards his impending confrontation with Vader. Mentally, and physically, Luke was preparing himself for the sole goal of defeating Vader. And then, SURPRISE! This was a huge moment for Luke’s character. Everything could have fallen apart right here, but lucky for us Luke was smart enough to fall down a ventilation shaft and get the heck outta there. By the sixth movie, Luke’s goal and drive was to win his father back. He was calm, focused, and frighteningly strong. He faced down Vader and the Emperor without fear. He declared himself to be a true Jedi and confirmed his belief in the good left in Anakin Skywalker. Because of his back and forth battle with Vader, emotionally, physically, and mentally, Luke walks out of Return of the Jedi a total superstar. Darth Vader was trapped. He was evil, he hated the Emperor, and he hated himself. But he was too weak to do anything about it. Until he met Luke. “The Force is strong with this one.” He becomes obsessed with tracking Luke down and bringing Luke over to his side to join him and overthrow the Emperor. But that Luke is just too darned determined! He’s slippery, he has good friends who have his back, and Luke is surprisingly strong. Vader has to keep thinking outside of the carbonite chamber in order to track Luke down. He tries to play the “I’m your Daddy, I know you have Daddy issues” card and his kid purposely falls down a ventilation shaft to get away. Luke awakens something in Vader. He awakens whatever is left of Anakin that is buried inside of this dark Sith lord. Vader is in awe of this kid, his kid, who keeps popping back up and just getting stronger all the time. Vader is at war within himself, the Dark and Light side are both tugging at him. One side is his enslaved mind to his Master, and on the other side is his love and admiration for his son. Luke’s faithfulness and strength are strong enough to make Darth Vader shake himself out of years of darkness and slavery, and overcome the evil that is both himself and the Emperor. If Luke had never been forced to face Vader, he wouldn’t be so strong. And if Luke hadn’t been so strong, Vader never would have returned to being Anakin. That right there is a showcase of the great power of a excellent sparring partner. Vader and Luke were sparring partners from the very beginning, even though the nature of their interaction with each other evolved and changed throughout the story. The Martian has to be one of the best films I have ever seen. It was man vs. Mars wrapped up in a dramatic, yet lighthearted and educational package.. There is no villain in The Martian, but there is an antagonist, and one heck of a sparring partner: Mars. An inanimate object, a thing with no mind, will, or emotions still takes on the role of the opposition. In order to stay alive, Mark Watney has to essentially beat Mars. He has to out-think, out-math, out-science, out-wit, and out-mental Mars. Mars proves to be a pretty tough sparring partner. It constantly throws things Mark’s way that almost kill him. Mark jumps through hoops, solves seemingly impossible equations, and comes up with gadgets and gizmos that would make MacGyver weep. Mark also grows very mentally strong during this ordeal. While he faces heartache, loneliness, despair, and fear, he never gives up. The Mark Watney who went into space with his buddies is not the same Mark Watney that comes back to earth. He has conquered the unimaginable and come out victorious. Mark still has an affection for Mars. Even though just about every aspect of Mars was trying to kill him on a regular basis, Mark appreciated the beauty and wonder of Mars. Mars was practically became a character in its own right. Mark’s character sparred with Mars and he grew exponentially. Those watching Mark grew. Mark’s goal to stay in the match (stay alive) with Mars created a ripple effect that went all the way down to earth. Thousands of people were effected and made stronger by the match with Mars. Yet another series that I have so much to say on, but now is not the time. The Jurassic Park films are an amazing example of using setting/circumstance as a sparring partner. I put the dinosaurs into the category of setting because the dinosaurs are not dangerous for any emotional or personal reason. This takes the soul and emotion out of the situation, fitting it more into the category of an emotionless setting or circumstance rather than an emotionally-driven character. While there are human villains in these films, those humans and their effective harm pale in comparison to the dinosaurs and the damage they cause. Yes, a dinosaur is a living creature, but it is a creature without a spirit and soul. The dinosaurs in Jurassic Park are merely behaving out of their instincts, making them less personal, but no-less deadly. This of course was changed in Jurassic World, when the Indominus Rex began to rampage beyond the need for food or defense, but instead merely for sport. The characters in the first 3 Jurassic films often go into the situation with wide-eyes and little wisdom. It doesn’t take long for them to realize that they are pretty well out-matched and they are going to have to adapt and learn fast if they want to live. The ones who make it out do so because their characters had a growth spurt. They learned to stop underestimating these animals. They learn the animals’ strengths and weaknesses. The animals also change and adapt. The velociraptors in particular. They experience new circumstances, absorb the information, and then adapt to the new situation. More than any other dinosaur species in this movie series, the velociraptors prove that they are not stagnant and will continue to change and grow. That makes them ever-increasingly difficult to defeat. This is an incredibly unique set-up, one where an animal is the human’s great sparring partner/enemy, but the non-emotional creature is also learning and growing because of the human’s involvement. The need for good sparring partners is vital for any story, be it a film, a book, or your real life. I draw a lot from studying these interactions on screen, and I hope now you can too. What type of sparring partners do you enjoy the most? Villains and heroes? Love interests? Best friends? Setting/circumstance? What are some of your favorite sparring partners on screen? Do you have great real life sparring partners that help you grow and mature? I’d love to hear your stories and your opinions. Share what you love, I want to know what you think. And if you missed my previous article, you can find it here. Spirit: Stallion of the Cimarron is a movie about a wild stallion who finds himself taken into captivity by humans. Spirit’s primary objective in the film is to regain his freedom and return home to his wild herd. It’s a magnificent movie on so many levels. The story is beautiful and unique. The characters are deeply engaging. The music grabs your soul and will not let go. Spirit is a character that stirs the deepest parts of you and makes you want to stand up and fight. This was one of my favorite childhood films for all of these reasons. But looking at this film as an adult, I can now appreciate it at a whole new level. Watching it again, I noticed something that I had instinctively felt as a child, but could never put into words. Spirit is a movie about a horse, told with the voice of a horse. In every story there is a primary voice that is telling the tale. This voice can take on many forms, and it can come from any character; but it is this voice that filters every single detail in any story. It is this voice that will lead you-the viewer- in knowing how to think and how to feel. This voice determines the message of the story. Without a clear voice, a story will feel limp and useless because it lacks direction and a strong foundation. Spirit did so many things right on every level of cinematic storytelling. Why? Because the voice in Spirit was authentic and spoken through every single detail of the movie. Here are some specific examples of how the voice in Spirit was made authentic. Horses communicate via body language. Ears forward=alert. Ears laid back flat= aggressive, etc. Snorts, whinnies, stamping; all of these communicate different thoughts, emotions, and instincts being expressed. Spirit was a movie where a horse was the primary character. We saw the world through Spirit’s eyes; in order to put ourselves into his hooves we had to understand communication the way he did. Spirit made use of every body movement and sound that horses make. We clearly understand what all of the horse characters were thinking and feeling even though very few of us naturally speak “horse”. Not a single horse character ever spoke words, thank goodness, or this whole movie would have felt cheesy and stupid. No, in order to live and breath this story we didn’t need the horses to speak our language, we needed to be able to understand theirs. Even though so much was communicated through the horses’ body language, we still needed some sort of narration to happen in order to bring us through the story. Given that Spirit himself is the one telling his story, it would make sense for him to do the narrating. They could have done this where Spirit chimed in with a comment every few seconds, or told us the story from start to finish while we merely watched the motions. Both ways would have made this movie less than it was. The way the filmmakers chose was incredibly brilliant. Our narration was Spirit’s inner dialogue, his thoughts so to speak. His impression of a situation, his instinctive reactions to things, etc. This put us inside of Spirit’s head and heart in a way that no other narration could have done. These thoughts had to be clear enough for us to follow them, but it was vital that they stay as true as possible to the authentic “horse” voice. The writers did this in multiple ways. Spirit never uses proper nouns. The one time he uses a specific name for someone is when he is referencing the term the soldiers use for his Indian friend, Little Creek. Instead of using specific terms, Spirit uses vague generalities. They, he, him, her, she, I. We always know of whom he is speaking, but he never calls them by name, that is reserved for the human characters of this story. While horses do understand commands and recognize differences in people and other animals, I don’t imagine that they think of those people by name. It’s more about how those people smell, sound, and feel. It’s more about visceral things than intellectual categorizing. Spirit takes in his world in a vaguer way, trying to understand it, but he doesn’t intellectualize it. Spirit doesn’t narrate all of the time. There are very long sequences when all of his communication happens with his actions; again, he is speaking as a real horse would. This puts us into the mind of an animal instead of a human mind. Human minds have a constant running dialogue. Spirit’s mind is more instinctive, and physical. He doesn’t have five million little details running amok in his brain. His one driving force and thought for most of this movie is to regain his freedom. Spirit’s thoughts are never connected to his mouth. If this were a movie with a “talking horse” it would have been utterly cheesy and failed in delivering authenticity. Yes, we do know what Spirit is thinking, but it is almost as if his mind is a separate entity from his body. We are in the first-person perspective of this horse. We feel what he feels, we want what he wants, we struggle when he struggles. And we do it the way he does it, as a horse. Yes, a horse with heightened emotions and soul, but still a horse. The sounds of this movie are very gritty and earthy. I mentioned above how much of the story is told through the horses’ body language. That body language makes a lot of noise. Stamping, chomping, snorting, running with hooves on the ground, whinnies, nickers, shrieks, we hear it all as if we were there experiencing it firsthand. The sounds of this movie are very natural, after all, it’s a horse’s world we are entering. The sounds of the military fort feel unnatural. The marching of iron-shod hoof beats in formation feel strange compared to the more random fall of hooves for a wild herd of horses. There are whips cracking, the shouting out of military drills, and bugles. And then when Spirit is tied to the post for three days there is an eerie and still the silence in the night. The wind whooshes, the water roars, the eagle shrieks high up in the mountain air. The bison snort, a mountain lion roars. The thunder of pounding hooves raises your heartbeat. You are a part of this story, body and soul. You hear it as if it were happening around you, your heart becomes connected to this land, this place on a sensory level, exactly how Spirit feels. To you, I will always return…. Bryan Adams and Hans Zimmer delivered on this movie. The music reaches that wild part of your soul and pulls you into Spirit’s soul. The music is also an excellent part of the narration, almost as if Spirit’s soul had created a soundtrack that put words and melodies to the deepest instincts of his heart. Spirit is a wild horse that lives in the vast West. The landscape is as much a part of who he is as his organs. He is the wind, the sky, the grasses, the rolling hills. He is the eagle that flies free. He does fly at the end of the movie when he makes his fantastic leap for freedom. Spirit is the fierce and rushing water, and the gentle warmth of the afternoon sunshine. He’s the cold snow, the fire, he’s all of it. This is his world that he interacts with on a very personal level. It reflects him and this journey that he is on. Humans rarely interact with an outdoor setting like this, but this is a wild horse’s world. We needed to understand and interact with that world as Spirit did in order to understand him. We needed to love and depend upon this wild place the same way he does. This world is in his blood, and by the end of the movie, it’s in ours as well. I have not come across another movie quite like this one. It is unique and authentic. This movie made in impression on my soul like few others have. I used to ache for wide open spaces and dream in my sleep about running across hills and mountains. I understand Spirit’s desires so well because they were like some of my own. When I watched this film, I fully entered into Spirit’s character. I became him for a time. That is the power of an authentic voice. You can communicate so well with your audience that they feel they have become a part of your story/character/world. This is powerful way to connect and communicate. If you are a storyteller, find the voice that will communicate your message the clearest. Use that voice to filter every aspect of your story, doing so will bind your story together tightly and deliver a powerful impact. If you are a viewer, look for the voice in the stories you love to watch. Seek out the voices that have spoken the most deeply to you and dig deeper. You will be amazed at what you learn about yourself. I am so thrilled that I was able to share this post with you. This is a subject and movie dear to my heart. I hope this post can touch you as well. You too have a voice, how are you using it to tell your story?